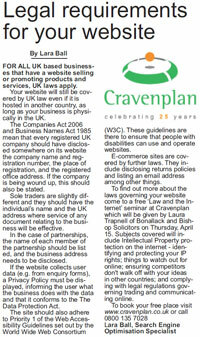 Cravenplan Computers has featured regularly in the local press as we are a high-profile company with many local connections. We have always focused on good relations with local businesses and have made many friends (both personally and professionally) through our free seminars. 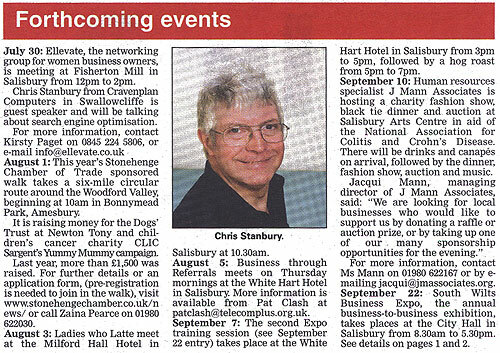 For some years Chris Stanbury also contributed regular articles to The Salisbury Journal. To find out more, read these articles. THERE was always going to be a lot of head scratching before a relevant play was chosen for IT company Cravenplan Computers to sponsor at Salisbury Playhouse. After all, there aren’t that many plays with a plot about search engine optimisation, Websites or Google. 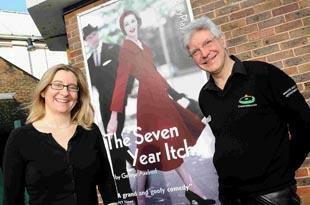 But, says Cravenplan boss Chris Stanbury, after putting his head together with the people at Salisbury Playhouse, a solution has been found - The Seven Year Itch, which is being staged at the theatre from March 15 to April 7. Mr Stanbury, whose firm is in Swallowcliffe, explains: “The link is seven years and the amazing things which have happened with the web in that time. Cravenplan was the winner last September of Salisbury Playhouse’s third Show Business draw. Show Business offers 28 firms the chance to win a main show sponsorship package worth £7,000 for £250. The aim is to help local businesses raise their profile and funds for the Playhouse at the same time. The winning firm has its logo in 40,000 brochures and 10,000 leaflets, gets a full-page advert in the show’s programme and complimentary tickets for the sponsored show. Runners-up get their name in the brochure and programme of the sponsored show. Mr Stanbury said: “I am a great believer in theatre and I have enjoyed coming to plays here. “I joined the Show Business scheme because it was good value for money and there’s a good chance of winning. Playhouse development director Kirstie Mathieson said another aspect of the partnership with Cravenplan was that the theatre would be hosting some of the firm’s free seminars, on eBayanddigitalphotography. “We will be bringing people into the building for a different reason and at a different time,” she said. One of the seminars, on eBay, takes place in two sessions on February 20 and the other, on digital photography, is on March 8, also in two sessions. Mr Stanbury added that the partnership would bring his company “a new audience”. Company boss Chris Stanbury will be hoping new Salisbury Playhouse artistic director Gareth Machin's spring/summer 2012 season includes a play with an IT connection. 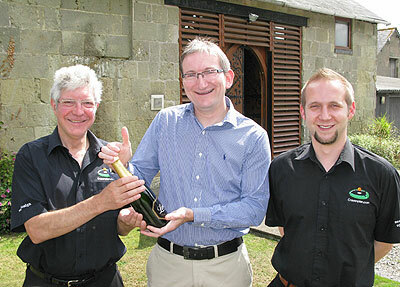 Chris, managing director of Cravenplan Computers, is the winner of the theatre's latest Show Business draw, and his prize includes sponsorship of a main house show in the spring/summer season. Previous winners were Wilton Carpets and executive coaching business Adrian Goodall Associates. Wilton Carpets plumped for the pantomime, Aladdin, which featured a magic carpet - an ideal choice for a carpet designer and manufacturer. Adrian chose The Constant Wife, a play which focuses on the main character's resourcefulness - a regular theme in the work he does with senior executives. Cravenplan builds Websites and specialises in search engine optimisation, aiming to ensure its clients' Websites are the first port of call for potential customers. Cravenplan's name was drawn out of the hat by Adrian at a ceremony at the Playhouse earlier this month, attended by 40 businesspeople. Chris said he was delighted to have won the draw, but sad he was unable to be there on the night. "We are delighted we can support the Playhouse because I think it's a great local resource," he said. "It will be interesting to see what they come up with that will tie in with something we do. "I like a play with a good plot - thrillers are fabulous, but I don't go a bundle on musicals." 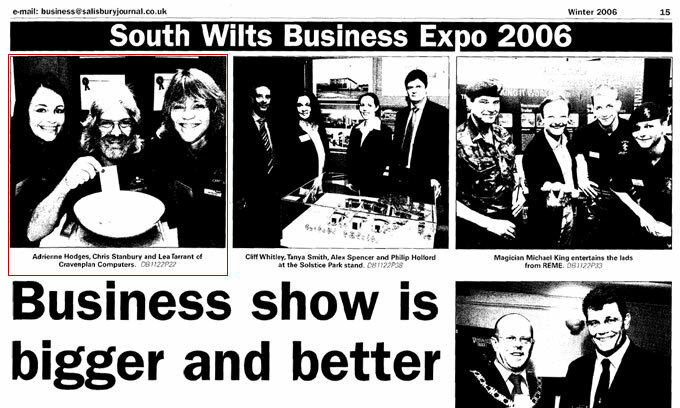 Show Business, launched at South Wilts Business Expo in 2009, offers 28 firms the chance to win a main show sposorship package worth £7,000 for £250. The aim is to help them raise their profile and funds for the Playhouse at the same time. The winning firm had its logo in 40,000 brochures and 10,000 leaflets, gets a full-page advert in the show's programme, complimentary tickets for the sposored showand a public relations package. At the ceremony, Playhouse development director Kirstie Mathieson said the theatre "greatly appreciated the support of business". "It gives us confidence for the future," she said. "We are looking forward to working with the winner." Adrian referred to a 2009 survey of 1,500 chief executive officers from around the world who said the most important leadership quality was creativity. "Being creative and innovative, being able to change and being adaptable is what Salisbury Playhouse does - it's a fantastic example of creativity," he said. "I felt very lucky to win this last year - I felt so welcomed by Kirstie and the Playhouse team, and I got fantastic publicity. "We met the cast and director and had a party whereby my clients, friends and colleagues could come along and have a brilliant evening." 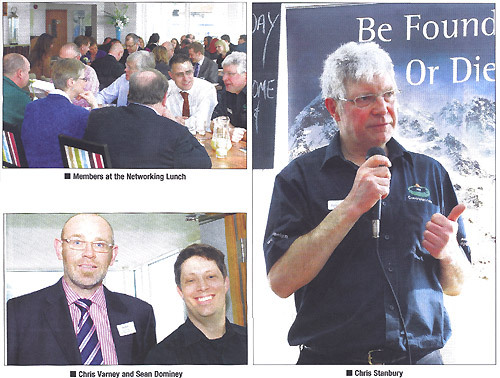 Cravenplan attended and sponsored the Dorset Chamber March Networking Lunch at Branksome Beach Restaurant. Understanding how your customers are thinking and behaving is the key to a successful Website. You can use psychology to help give your site the edge and make the difference between a visitor staying on your site or leaving. The web is a place where surfers expect to find information fast. People scan web pages rather than reading them and if your site doesn’t quickly provide something of use, visitors will simply go to a rival with the click of a mouse. The design and wording of your site is very important. There are many factors to consider when planning or reviewing your site and many ways of gathering information on web psychology. For an existing site, using an on-site analytics package such as Google Analytics or WebTrends will enable you to see how many people are coming to your site, using what search terms and which pages they are viewing, entering your site on and leaving from. The data can be interpreted to help you refine your site and make it more relevant and effective. Off site analytics relates more to who is looking for what and where. For example, studies have been done to track where the eye is drawn to on a web page so that important information can be placed prominently. All the data you gather then needs to be compared to what your site can offer so that you can decide how to move forward effectively. Your site will need to tick a few boxes for people to engage with you. Consider things such as ease of use, an attractive and professional design, easy to read copy, useful information, fun things to do, promotions, relevance, and how recently you update your information. If you want to know more about the psychology of the web such as how to build trust and how to avoid putting visitors off, Cravenplan are offering a free one hour seminar on the subject on 14th October at 1pm. Book online at www.cravenplan.co.uk or call 0800 1357028. Cravenplan are celebrating after successfully completing a champagne challenge set by their client Alpine Property Investments Ltd. Alpine challenged Cravenplan to move their Website up over 90 places in Google UK in just four months for the search term ‘Swiss property’. The reward for getting them to the first page of search results and completing the challenge was a bottle of champagne. Alpine started search engine optimisation with Cravenplan in March 2010 and at the time they weren’t in the top 100 results for ‘Swiss property’. The phrase was competitive, with many other companies also wanting to be found in the top Google results for the search term. After months of hard work by Cravenplan SEO specialist John Birch, Alpine made it to the first page of Google. 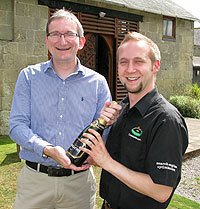 Alpine Property Investments Ltd MD Steve Thomas was thrilled with the results and presented John with a bottle of champagne at the Cravenplan offices in Swallowcliffe. “It is always great when a client shows how much they appreciate our hard work. I'm really pleased with the results I've managed to achieve for Steve so far and once the new Alpine site is launched later this year, we should be able to do even better for them. Helping a business to grow in the current economic climate is great and is a testament to how SEO can help a business,” he added. MORE businesses are creating videos for the web - and there are good reasons why. A video can help you stand out from the crowd. It can also get a message across to an audience very effectively, while holding interest. It can be used as an advertisement for your company, or to show a particular product in action. It can add a face to your company, show how professional you are, show how creative you can be but, most importantly, it can help raise awareness of who you are and what you do. A video is potentially a fantastic marketing tool. Video can be used to good effect to enhance user experience of your Website such as with Appleford School in Shrewton which has a video accessible from their home page. 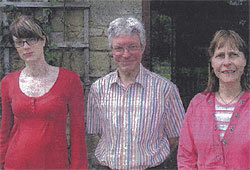 Appleford is a school for children with dyslexia and associated learning difficulties. Dyslexia often runs in families and so the parents of pupils can also have difficulty reading. A video is a great way for parents to find out about the school and what it can achieve for their child, without having to read lots of text. Video can be so useful that it can even become a runaway marketing success. An example is Blendtec, a blender company Stand out on the web with a video who were not very well known. That was until they started their ‘Will It Blend’ campaign. An employee spotted the company CEO testing a blender using 4x2 wood. He realised the potential of what he was seeing and soon extreme blending videos hit the web and went viral. The company tried blending iPads, glowsticks, silly putty and many other items. Millions saw the videos and Blendtec became very well known, making money from the advertising revenue generated at the same time. See the videos at www.blendtec.com/willitblend/. I am not suggesting you go out and make an extreme video, but simply that you consider using video in some way to enhance your company’s public profile. There are things you should avoid with video, and things you should be aware of, before rushing into putting film on the web. Should you put the video on your site or on YouTube? Should it go on your homepage or an internal page? Should it be autoplay? Can I make the video myself or will it look unprofessional? To get the answers to these questions and find out more about video – what it can do for you and the pitfalls to avoid, Cravenplan offer a free seminar on the subject on July 8 at 1pm. Book online at www.cravenplan.co.uk or call 0800 1357028. PAY PER CLICK (PPC) is a form of Internet marketing and a valuable tool. It is also known as ‘paid search’. A business will use PPC to help their Website get found quickly by the search engines. The process involves bidding on certain keywords to bring relevant traffic to your Website. The cost is controlled because you set the budget and you only pay at the point when someone clicks on your advert. PPC is especially good on a new Website, in a competitive market for your keyword search terms, or if running a short-term promotion. There are drawbacks such as, when your campaign reaches its end date, your adverts stop showing, therefore your Website visitor numbers drop. It is also open to click fraud: someone with no intention of buying your products or services deliberately clicks on your advert to use up your budget. Another is that web users generally trust paid advert Pay per click - best for marketing? much less than those that a search engine will return naturally. Search engine optimisation (SEO) is the marketing process geared towards getting your Website found and returned high in the natural listings of Google, Yahoo! and Bing. PPC isn’t as effective as search engine optimisation over the long term. The best marketing solution in many cases is to use PPC and SEO together, because the two forms of search marketing complement each other. The benefits of using PPC and SEO together are that your risks are spread by using a dual strategy, and PPC can fill the gaps where your Website is not normally found in the search engines. Also, if you are concerned about really dominating a market, using the two strategies together can result in ‘blanket branding’ i.e. your site will appear both in the paid listings and natural listings. Pay per click is a useful way to generate targeted traffic to your Website. Whilst a PPC campaign can work well on its own, the best way to use it is conjunction with SEO. FOR ALL UK based businesses that have a Website selling or promoting products and services, UK laws apply. Your Website will still be covered by UK law even if it is hosted in another country, as long as your business is physically in the UK. The Companies Act 2006 and Business Names Act 1985 mean that every registered UK company should have disclosed somewhere on its Website the company name and registration number, the place of registration, and the registered office address. If the company is being wound up, this should also be stated. Sole traders are slightly different and they should have the individual’s name and the UK address where service of any document relating to the business will be effective. In the case of partnerships, the name of each member of the partnership should be list ed, and the business address needs to be disclosed. The site should also adhere to Priority 1 of the Web Accessibility Guidelines set out by the World Wide Web Consortium Legal requirements for your Website (W3C). These guidelines are there to ensure that people with disabilities can use and operate Websites. E-commerce sites are covered by further laws. They include disclosing returns policies and listing an email address among other things. To find out more about the laws governing your Website come to a free ‘Law and the Internet’ seminar at Cravenplan which will be given by Laura Trapnell of Bonallack and Bishop Solicitors on Thursday, April 15. Subjects covered will include Intellectual Property protection on the internet - identifying and protecting your IP rights; things to watch out for online; ensuring competitors don't walk off with your ideas in other countries; and complying with legal regulations governing trading and communicating online. SEARCH engine optimisation (SEO) is the process of improving a Website - using both on-site and off-site techniques- to make it more relevant to the search engines. The aim is to maximise the chances of the site being listed in the top unpaid results of search engines such as Google, Yahoo! and Bing when someone searches for phrases relating to your business. Companies use SEO to get their Website good listings because 51% of web users look at the No.1 result, compared with only 1% for No.8. Many people don’t look at Websites that are, not on the first pages of results so it is really important to get your Website seen. SEO works and is cost effective compared to other types of marketing. It will bring you more visitors and high quality traffic. It is especially effective for niche Websites but will work for any type of site. It should be seen as a longterm, full-time project if you are serious about achieving high rankings. It often takes six months to a year to begin to see significant results. 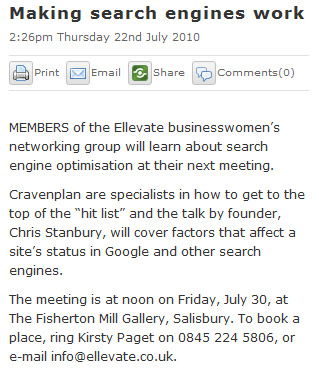 To find out more about SEO visit www.cravenplan.co.uk or www.befoundordie.co.uk or call Cravenplan on 01747 858002. FOR many businesses, an online presence can be the difference between make and break, especially during a recession when fewer people are inclined to hit the high street, perhaps for fear of spending too much. Proof that demand for web services is buoyant comes from Cravenplan Computers Ltd, of Swallowcliffe, whose managing director Chris Stanbury says that 2009 has so far been an "exceptional year". It has exceeded all his expectations, he says, and adds: "Not only are we celebrating our 25th birthday this year, but several of our web clients have now been with us for 10 years. These include Bush Farm Bison Centre at West Knoyle, Jacqueline Flexney-Briscoe, a Shaftesbury and Harley Street-based physiotherapist, and Tav Engineering, based in Christchurch." Chris Stanbury decided early in the year, in conjunction with his team, to set an ambitious target of gaining 25% more new search engine optimisation (SEO) clients this year. So far they have achieved almost a 30% increase and the pace is still increasing. He says: "We decided to set our sights high this year as a challenge during the recession and through emplying various marketing tactics we have achieved a great deal." This means that Cravenplan has 100 clients currently on its books, the latest of which is Virginia Hayward, the hamper company, of Stour Row. As a result of this increase in work, the company has recruited one new full-time member of staff to the SEO team, Lara Ball, who started earlier this month, and is looking to recruit another experienced SEO specialist soon. Chris founded Cravenplan in London in 1984, providing programming services to businesses, and later sold computer hardware and software. Over the years the company has evolved and changed with the times and in 1997 he moved the entire operation to Swallowcliffe, near the Wiltshire-Dorset border, along with all the staff. 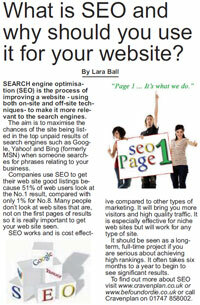 These days the company designs bespoke Websites, but the main core of its business is the search engine optimisation. This is a relatively new field within the computer industry and focuses on improving the position of Websites within the search engines. Employing the correct tactics and strategies for a Website can virtually guarantee higher visitor numbers and therefore sales. Sean Dominey is the head of SEO services at Cravenplan. Call him on 01747 858000 to find out more or go to the interestingly named Website www.befoundordie.com. Mr Stanbury decided early on in the year, in conjunction with his team, to set an ambitious target of gaining 25% more new Search Engine Optimisation (SEO) clients this year and so far they have achieved almost a 30% increase and don’t intend to stop there. Mr Stanbury said ‘We decided to set our sights high this year as a challenge during the recession and through employing various marketing tactics we have achieved a great deal.’ This has also meant that the company also has 100 clients currently on its books. As a result of this increase in work, Cravenplan Computers have already recruited 1 new full time member of staff to the Search Engine Optimisation team, Lara Ball, who started with them in October 2009, and they are looking to recruit another experienced Search Engine specialist in the near future to further complement the team that they already have. Cravenplan Computers was founded in 1984 by Chris Stanbury in London providing programming services to businesses and later sold computer hardware and software. Over the years the company has evolved and changed with the times and in 1997 he moved the entire operation to Swallowcliffe, Wiltshire along with all the staff. These days the company designs bespoke Websites, but the main core of its business is the Search Engine Optimisation carried out by its team of dedicated specialists. Search Engine Optimisation is a relatively new field within the computer industry and focuses on improving the position of Websites within the search engines. Our statistics show that sites that have SEO have over 14X the number of visitors than sites that do not. Did you know that more than 95% of people searching on the web do not go further than the first page of rankings? and that the difference between the number 1 and number 2 position can mean a difference of over 50% more visitors? By employing the correct tactics and strategies for your site you are virtually guaranteeing higher visitor numbers and therefore sales through your Website. Whilst many companies are suffering at the moment due to the recession Cravenplan Computers, based in Swallowcliffe, are bucking the trend. Setting themselves a challenge they decided early on in the year to increase their turnover by 25% before the end of December. They consulted several local marketing companies for their expertise in April and their latest client, Virginia Hayward, based in Stour Row, has taken them over that 25% target - and we are only in September. In preparation for their marketing efforts they reviewed their client history and discovered that their average client has been with them an impressive 4 years. Not bad going as Search Engine Optimisation has only been around for about 10 years. To increase their turnover this successfully they did not employ any magical tricks but improved on what they were doing already. To get a Website high in the search engine rankings takes time and skill employing a range of different techniques to achieve the best possible results - especially as the search engines often change their parameters, so what may be successful one month might not work the following month. Did you know that more than 95% of people searching on the web do not go further than the first page of rankings? and that the difference between the number 1 and number 2 position can mean a difference of over 50% more visitors? By employing Cravenplan and their team of dedicated Search Engine Optimisation experts, Virginia Hayward are ensuring that as their Website improves its listing in the search engines they will see an increase of customers and therefore sales. NEXT Thursday there is the chance to attend a workshop and a seminar. Solicitors Bonallack & Bishop of Salisbury are hosting V-Den, a "Dragons' Den" workshop for fast-track business owners, and Cravenplan Computers of Swallowcliffe a free seminar, entitled Writing for the Web. V-Den will be held at the Grasmere House Hotel in Harnham and the seminar at Cravenplan's Offices in Swallowcliffe. The V-Den workshop has been devised by the BowShot Vector Group, a group for aspiring entrepreneurs in Dorset and Hampshire. Tim Bishop, Bonallack and Bishop senior partner, said: "BowShot Vector has been running successful V-Dens in Dorset for some time and I am really pleased to run a second event in Salisbury with them. "The first V-Den we held in Wiltshire proved to be a very exciting event and those who attend should expect to be challenged, entertained and informed." WEB design and search engine company Cravenplan Cromputers has appointed two new staff members in a job sharing role as administrators. Kandi Eden, an art college graduate, is working part-time while talking a homeopathy course, and Sorrel Buchanan, who has run a music photography Website business and worked in administration in a language school, have joined the Swallowcliffe company. Managing director Chris Stanbury said: "I have been looking for some time to find the right people to carry out all the many administrative jobs that an expanding company like ours needs and am delighted to welcome Kandi and Sorrel to Cravenplan." It was a case of "hair today, gone tomorrow" when Chris Stanbury of Cravenplan Computers had his beard shaved off and his hari cut in aid of Salisbury-based charity Hope and Homes for Children at a quiz evening at Salisbury Arts Centre. This was an amazing sacrifice for Chris, the new chairman of the charity's support group, who has never been without a beard since he was a boy. His sacrifice has already raised more than £6,000 in sponsorship. Hope and Homes for Children specialises in tracing relatives for abandoned children in war torn countries, or if this is unsuccessful, finding family homes for these orphans. The charity aims to make the most of the donations and contributions it receives, not only directly but also by taking care to use local labour and committed local people, thus avoiding the corruption that can often be associated with work in deprived areas of the world - 87% of the money raised is sent to the countries they work in. Hope and Homes for Children was founded in 1994 by Mark and Caroline Cook. Mark, then the British UN Commander in Croatia, left his 30 year army career after making a promise to help 60 children living under bombardment in the cellar of their destroyed orphanage. The charity has now expanded to provide support to families and children right across Eastern Europe, into Africa and further afield. 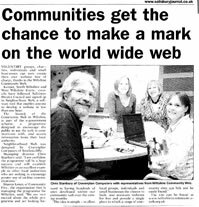 Voluntary groups, charities, individuals and small businesses can now create their own Website free of charge, thanks to Wiltshire Community Web. Kennet, North Wiltshire and West Wiltshire district councils have followed Salisbury District Council and signed up to Neighbourhood Web, a software tool that enables anyone to develop a Website in less than one hour. The launch of the Community Web in Wiltshire is part of the e-government scheme, a programme designed to encourage the public to use the web to communicate with, and access information from, their local authority. Neighbourhood Web was designed by Cravenplan Computers of Swallowcliffe. Managing director Chris Stanbury said: "I am confident the programme will be a huge success and will establish Wiltshire as an excellent example to other local authorities who are seeking to encourage greater use of on-line communications." Sharon Leney, of Community First, the organisation that is managing the programme for Wiltshire, said: "We are very excited about the whole programme and are looking forward to having hundreds of sites developed within our community web over the coming months. "The idea is simple - to allow local groups, individuals and small businesses the chance to build and maintain Websites for free and provide a single place in which a range of community sites can link and be easily found." The site can be found at www.wiltshirecommunityweb.org.uk.